Nicola Kate Makeup: Lime Crime: Pink Velvet Velvetine! 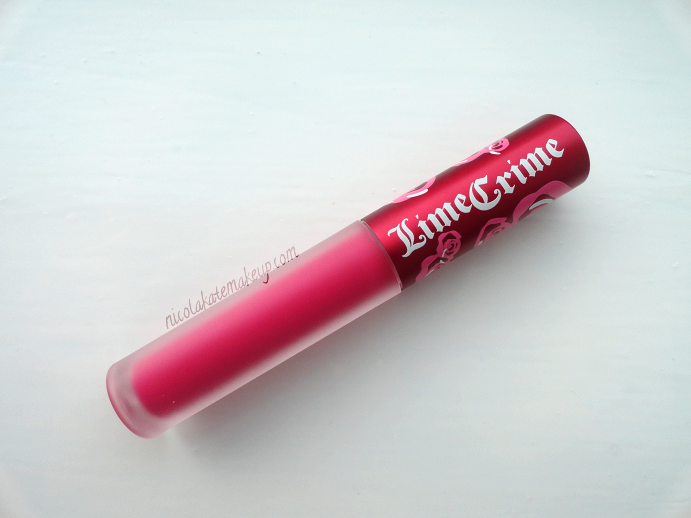 Lime Crime: Pink Velvet Velvetine! Hey lovelies. Wishing everybody a very Happy New Year! I hope everybody had an awesome time on New Years Eve and now I'm welcoming you to my first post of 2014! What better way to kick start the year than with the hugely anticipated Pink Velvet Velvetine by Lime Crime? After the huge success of the Red Velvet and Suedeberry Velvetines (you can check those out here! ), last month Lime Crime finally added the long awaited Pink Velvet to their Velvetine collection, along with a brand-spanking-new package design. The Velvetine hype is bigger than ever following the arrival of this new addition, and rightfully so. As I wrote in my last Velvetine post, these liquid lipsticks really are well worth the dosh. Incredibly opaque, extremely long lasting on the lips, and a little really does go a long way: All the things that make a product great value for money. I really just wanted to share my excitement about this with you and also demonstrate how gorgeous Pink Velvet is when it's worn. gorgeous ♥ i'm also in love..
Love it!!! I have pink velvet, i was curious do you use a lipliner with it or wear it by itself? Would you say that this is a dupe for macs girl about town or pleasure bomb? Do you remember what lip liner you used by chance?